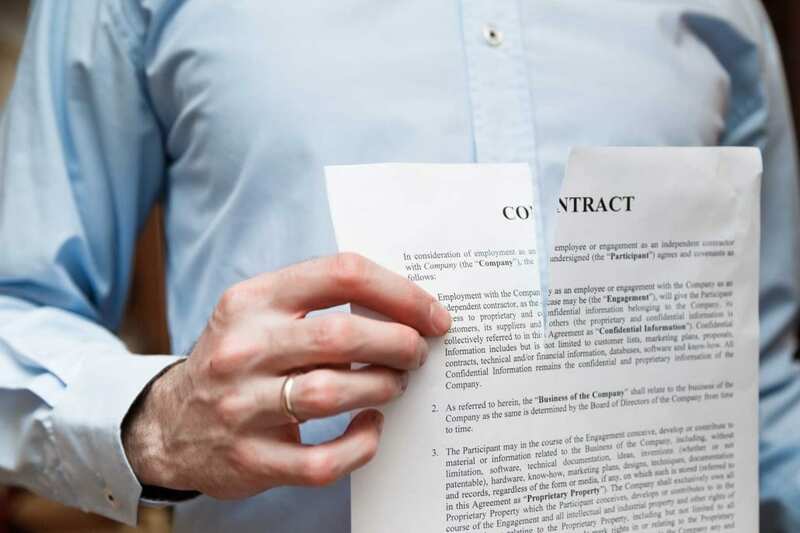 Employment Law: The End of the 24 Month Cap on Severance? Employment Law: The End of the 24 Month Cap on Notice / Severance? 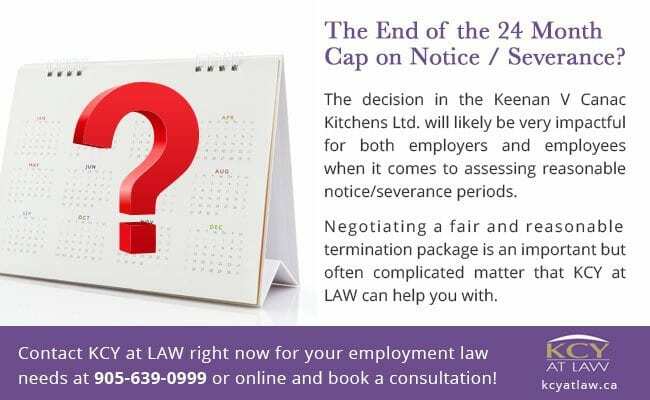 In the recent Ontario Court of Appeal decision Keenan v Canac Kitchens Ltd., the Court of Appeal may very well have eliminated the notion of a 24-month cap of notice and severance following the termination of employees on a “without cause” basis. 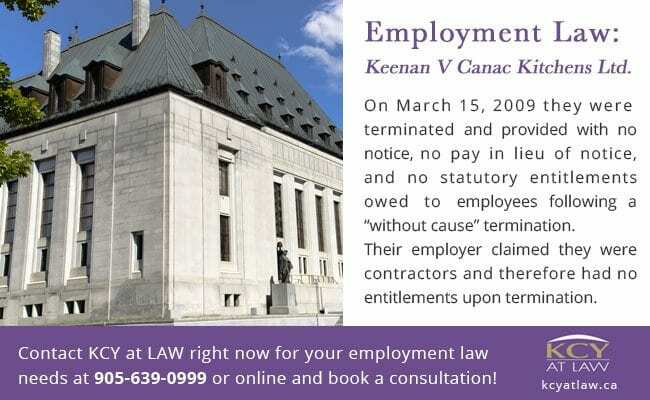 Employment Law: Keenan V Canac Kitchens Ltd. In Keenan v Canac Kitchens Ltd. Mr. and Mrs. Keenan were hired as full-time foremen for Canac Kitchens in 1976 and 1983 respectively. They both worked in this capacity through until October of 1987 at which point their employer informed them they would be continuing their employment as contractors and not full-time employees. Despite this change in the classification of their employment, they both continued to work exclusively for Canac Kitchens until 2007. By 2009, while they had performed some work for other employers, the majority of their work remained with Canac Kitchens. On March 15, 2009 they were terminated and provided with no notice, no pay in lieu of notice, and no statutory entitlements owed to employees following a “without cause” termination. Their employer claimed they were contractors and therefore had no entitlements upon termination. The trial judge and the Court of Appeal both held that they were considered “dependent” contractors despite there being a two-year period where they did not work exclusively for Canac Kitchens. Given that the vast majority of their employment was exclusively with Canac Kitchens, the Court of Appeal held that this was determinative in deciding that they were “dependent” contractors. The Court of Appeal ultimately upheld the decision by the trial judge to award 26 months of notice, taking into consideration the fact that Mr. and Mrs. Keenan worked an average of 28.5 years between themselves, were 63 and 61 years of age, held supervisory roles, were Canac Kitchen’s public face for approximately 30 years, and that the “substantial majority” of their work was done for Canac Kitchens. This decision will likely be very impactful for both employers and employees when it comes to assessing reasonable notice/severance periods. Negotiating a fair and reasonable termination package is an important but often complicated matter. We at KCY at LAW have the employment law experience and expertise necessary to effectively assist both employers and employees to ensure your legal rights are properly looked after. Contact KCY at LAW right now at 905-639-0999 or online and book a consultation! 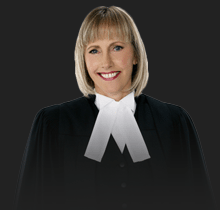 https://www.kcyatlaw.ca/wp-content/uploads/2016/02/The-End-of-the-24-Month-Cap-on-Notice.jpg 1094 1642 Kathy Chittley-Young https://www.kcyatlaw.ca/wp-content/uploads/2018/01/KCY-at-LAW.svg Kathy Chittley-Young2016-02-24 16:58:302019-03-08 19:29:50Employment Law: The End of the 24 Month Cap on Notice / Severance? Winter Road Authority Cases Damages For Pain and Suffering – What Are They Worth?